I found this book interesting because Harper knew little about Antarctica or the science studies connected with wintering over, but she lucked into a lesser assistant position. The reader learns about Antarctica and what Harper’s strong points are as Harper learns them (though a couple of times I did want to whack her upside the head). Still, people have to learn in their own time and way – and that does happen for Harper. I liked that Harper was good at her job, organizing the scientist’s notes and data. Ultimately she is generous to an unlikable member of the winter over team. 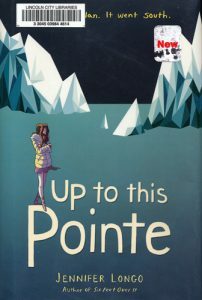 An unusual setting for a teen novel, it features two people who were dedicated to their futures and approached them with unfailing intensity and effort. To lose that would be devastating, and it does take Harper quite a while to move ahead. Longo, Jennifer. Up to This Pointe. New York: Random House Books for Young Readers, 2016. This entry was posted in Books & Reading, Youth Services and tagged Friday Reads. Bookmark the permalink.